In Canada, spring and summer is forest fire season. If you’ve ever been near one, you know they are at once terrifying and awe inspiring. Their destructive power is not to be underestimated. Square miles of once beautiful forests can be laid to waste in days, along with anything else that happens to live in the forest. Animals are driven from their territories, and any buildings that happen to get in the way are consumed along with the trees. 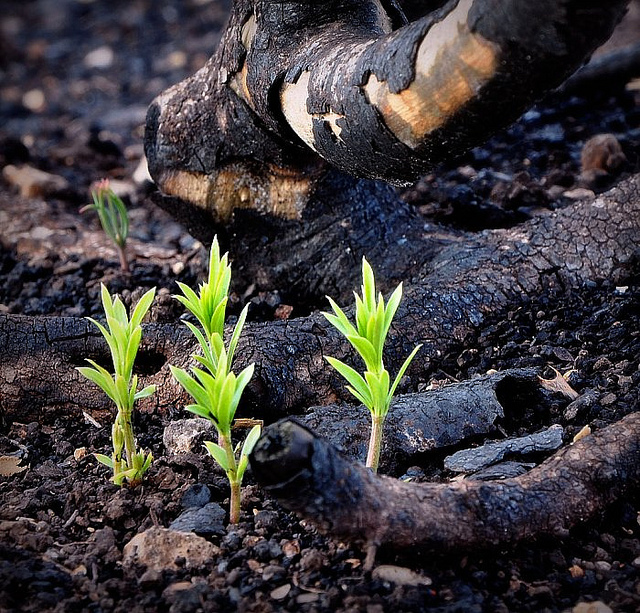 Yet a forest benefits from naturally occurring fires. It is one of those counter intuitive things in nature. The forest ecosystem needs a good fire occasionally. The larger, older trees form a canopy that blocks the light and suppresses new growth. Over the years, it also accumulates a lot of dead wood and brush on the forest floor, making it less passable for animals and less arable for other plants. A good burn cures a lot of these issues. At first, there’s nothing but a blackened mess. But as time passes – and nature is patient – new growth appears, often in the form of species of trees and other flora that haven’t been able to grow for decades. A new beauty arises out of the devastation, and long dormant seeds of the forest giants are released by the fire to start the process of re-establishing its majesty. It’s a cycle of renewal that is older than humanity, and one that has worked for nature on its own. Where forests and people now co-exist, humanity sometimes embraces these same processes to help the forests in more controlled ways. Good forest management often now utilizes prescribed and controlled burns to serve the same purpose without the dramatic impact to other life forms and human structures. Those of us who live in Alberta, Canada experienced a forest fire of the political kind this week. The political party that had held power for 44 years lost an election, dropping from a dominant majority position to third place where their influence will be marginal at best. The parallels are interesting. With no change in the ruling party, relationships got tight and cozy, people were given (and kept) powerful administrative positions return for political support and policy, while adjusted slightly, remained largely the same and didn’t recognize some of the more subtle shifts in voter attitudes. In other words, enough deadwood had accumulated on the forest floor that only a total burn would clear it out. This year’s shift in the economic winds that saw oil prices lose 50% plus of their value fanned the flames of change to a level that was no longer manageable by the ruling party. The results of the election saw a party that has never ruled in Alberta with an opportunity to govern for five years. The forest has truly been blackened, and the new shoots that are now coming up are truly green. Many of the elected members of parliament are still students in their early twenties that have never held a meaningful job, voted in by a suddenly active young voter segment that had enough of the “established way”. It will take a while for the forest to return, and we will likely be buffeted by the winds of change for a while as these rookies find their way. I don’t intend this to be a political statement. My sense is that when any leadership structure remains unchanged for that long we are at risk of such an event. Someone I am close to works for such a corporation. While public, it is tightly held and in a regulated industry. We refer to it as a dinosaur in that its ways have not changed for many decades. It is having difficulty attracting and holding young talent within a structure that barely makes sense to those who are approaching the end of their careers. When the top heavy layers of aging leadership all moves into retirement in the next few years, I fear that a very disruptive large “burn” is coming for this company as well. So how do we avoid these apocalyptic fires in the world of business and politics? Perhaps the real issue is that we are talking about complex systems, and the nature of such systems is that they resist change. These systems know how to operate in their current form, so there is a form of homeostasis at work that tries to keep them as they are. We notice individual fallen limbs and trees accumulating about us, but we learn new routes around them as we navigate within the system. The issue is made more complex by the fact that within these established systems the leaders may have been there for a long time, and may become part of the problem. Perhaps the key is in creating a system that requires change. One that systematically examines the health of the ecosystem and executes prescribed and controlled burns. I don’t mean this in any harsh or diabolical way. We have a few good means at hand. Just as term limits in politics can force small burns, do we utilize similar concepts within our leadership structures? Do rotate our executive assignments occasionally to both expose our people to different leadership styles and to allow new leaders to examine old ways of doing things? Do we have some concept of limited term for the CEO, such that we can allow for different leadership for different phases of the business and changing economic imperatives? Do we make succession planning a corporate wide activity led by our human resources group instead of making this a role of individual executives, who may tend to plan for someone in their own image to take over? Do we allow our organization to openly and honestly question the unquestionable? Are we able to critically examine those operating principles that show us “that way things have always been done around here” by asking why and whether there might be a way that serves us better now? As a couple do we allow small irritations, poor habits and minor incompatibilities to fester to the point where the level of resentment cannot be reversed? Or do we pursue more open dialog that allows these issues to be addressed individually, accepting that sometimes it will cause an argument or “small fire” that can be more easily controlled? As a leader, do we become more and more entrenched in a leadership style that served us well earlier in our career, but is ineffective or even toxic as a senior leader? Does it get to the state where we might be let go or placed on a performance improvement plan before we will address it? Or do we accept that feedback and coaching is a necessary part of leadership development and actively start our own “small fires” so that our style matures as we grow as leaders? Again as a leader, do we continuously provide feedback to our team members so they know both their strengths and challenges, allowing them to know where to focus their development efforts? Or do we shy away from the challenging conversations, creating the risk that the situation becomes so far out of alignment that termination is the only option? How does this principle of forest management apply to your work and life? How about at a corporate level? What examples have you seen where it has worked? Where have you seen drastic measures taken that could have been avoided? What a fascinating post Ian — as an experiential learner, I tended towards the ‘big burn theory if only because I intuitively put myself in places where scorched earth messages were inevitable. Now, I use my experiences to keep sweeping the forest floor through mindful meditation practices that encourage me to not hold onto deadfall. The forest fire is a great metaphor Ian. The idea of the older trees not letting light in for new growth jumped out at me! Leadership change is hard and can be painful when you’re one of the old trees (been there) but it also gives one compassion when they are one of the new shoots coming up in another organization. It is interesting how many ‘old guards’ did damage to their companies because they did not keep an eye on the winds of change eg: newspapers, magazines and encyclopaedias that were not fast enough to go electronic; kodak with its films missed the digital revolution … the next step must surely be converting to sustainable energy sources … (Oops, now I am getting political). Not political – just passionate! ?